Through the intercession of Cardinal Kung, may God bless my sister Mary with courage for her chemotherapy and restore her to health. I am very grateful to report that my sister, Mary Windsor, has just been declared "in remission" by her doctor after her relapse of cancer. She went through a treatment of chemotherapy, hospitalized more than twice and it was a very dangerous period due to her very strong and unfavorable side effect of the chemo treatment. After being very sick for 6 months, she is now free of cancer, and is slowing improving. My in-laws, Margaret and Ignatius Chu have also been praying daily to Cardinal Kung to intercede for Mary Windsor. Perhaps my name is familiar to you. Perhaps it isn't. Every year I have a Mass said in my parish (St. Hedwig, Floral Park, New York) for the persecuted underground Romand Catholic Church in China. I usually mail the Church bulletin to you. I send a check now and then for $20 dollars or so. I wish that I could afford more but I am a widow living on Social Security and a small pension. Last fall I was diagnosed with Stage 4 advanced metastastic melanoma at Memorial Sloan Kettering Hospital. I was sent there by North Shore Hospital with the same diagnosis. I was put in a clinical trial which is experimental and the drugs that are used are not FDA approved for general use. I spoke to you right after I had been diagnosed and discussed with you that I was going to see a Dr. Jen-Wen Hwu and asked you if you thought she was Chinese (She is Taiwanese). You said that she may be. You sent me a prayer card with your beloved Uncle's picture which included a relic. I said that prayer every day and touched the relic. I know that he is a Saint. He just hasn't been canonized yet. I feel that he is my intercessor (or one of them, at least). Update: I was diagnosed on Sept. 8th, 2003. 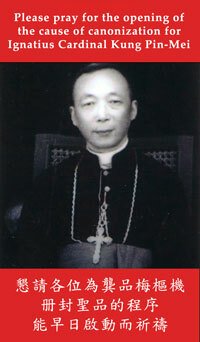 I noticed on the prayer card that Ignatius Cardinal Kung Pin-Mei was "taken prisoner for Christ" on the same date in 1955. I thought that was interesting that I further "bonded" me to him. And so I started the chemotherapy in October 2003. Now the melanoma, which started in my left eye necessitated the removal of the eye in March of 2003, had metastacized to the lungs (multiple tumors, the CAT scan showed s many white dots that one would think of a snowstorm), the back, the scalp. the left armpit lymph node and the liver. By December of 2003 the scans showed an improvement. Less tumors in the lungs and some shrinkage. The tumors in the scalp and lymph node and back were actually gone. My doctores were thrilled. Seventy percent of the people with my condition do not survive. I told them about prayer. I showed Dr. Hwu your Uncle's picture. By February or so, the cancer in the liver was gone. I continued taking the chemo and the lungs continued to show improvement. By July of 2004 the Doctors weren't sure if what they saw on the scans were scars where the tumors has been or very tiny tumors. On September 8th of 2004, the feast of Our Blessed Mother's Nativity and the 49th anniversary of your beloved Uncle's imprisionment, I was told that I no longer had to be on chemotherapy. It was exactly one year from my first CAT scan that was so frightening. I went to St. Hedwig's to give Thanksgiving. It was a Wednesday and we have Exposition of the Blessed Sacrament which ends with a Novena to Our Lady of Perpetual Help at 7:30 p.m. It starts at 9 a.m. after Mass and ends at 8 p.m. or so. At the 3 o'clock hour there is the Chaplet of the Divine Mercy which is so lovely. At the end of the Chaplet, the priest announced that a priest that I had great respect for and who I usually used as my confessor had gone to his eternal life that morning at 10 a.m. So September 8th has great meaning for me and always will. I will continue to prayer for those brave and holy Chinese the persecuted priests and laity who have such love for the faith that they risk their livers for it daily. I pray for you, that you will see in your lifetime, your dear Uncle recognized by the world and the Catholic Church and realize (99% of people do not, and these are Catholics (! ), sad to say), that China does not have freedom of religion and that priests, bishops and lay people are being imprisioned and even killed for trying to practice their faith. I just needed to let you know my story. Faith and prayer are so important. I am so blessed! And I am so glad for the day that I picked up a Catholic magazine and read your Uncle's unbelievable and wonderful story for the first time. I will continue to tell people about the situation in China and pass our the pamphlets. Most Catholics do not know about the underground Church in China. It would really help if the Bishops let the American Catholic populace know what is really happening. I am writing to my Bishop tomorrow. And I will continue to pray. God Bless You. 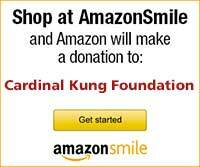 Please pray for the success of my cancer treatments through the intercession of Cardinal Kung. My friend M. has been praying everyday with Cardinal's relic and the prayer of intercession. Thanks also to the prayers of this prayer room, I have responded favorably to my initial treatments. Please continue to pray for me. Thank you Cardinal Kung. Through the intercession of Cardinal Kung, I pray that my dear friend, an elderly priest, will have peace and health so that he can continue to serve the Lord and His Holy Will. The health of my elderly priest friend (age 90) has greatly improved during the past two months. Thanks to the prayers of this prayer room and the Cardinal's intercession. Please join me in prayers for the intercession of Cardinal Kung to bring Jack S. back to health and bless him with grace and strength during his hospitalization. Jack S. returned home in August 2005 after over 3 months in the hospital -- including over one month in intensive care. Thanks for God's blessings and the Cardinal's intercession. Through the intercession of Cardinal Kung, may God grand healing to Christophe who will need surgery and treatment for brain cancer. May God bless him and his parents with comfort, strength, courage and hope. Thank you for all the prayers. My friend's son Christophe who had brain surgery is doing well. The tumor was benign and he is now at home with his parents and his brothers and sisters. I will be forever grateful! TPlease pray that a suitable medical arrangement can be found very, very soon for my friend, Lauren, to enable her to continue to lead an active life and be a witness to the mercy and love of God through the intercession of his servant Ignatius Cardinal Kung.